The first commemorative Newfoundland stamps were issued during 1897 to mark two very important anniversaries. The year also saw the introduction of a more modernistic series of pictorial definitive postage stamps featuring members of the British Royal Family. The big events of 1897 were the 60th Anniversary of the Reign of Queen Victoria and the 400th Anniversary of the discovery of Labrador and Newfoundland. The fourteen impressive looking commemorative Newfoundland stamps shown directly below were issued on June 24, 1897 to commemorate both of these anniversaries. There are a couple glaring errors in these commemorative Newfoundland stamps, which will be described further below. The technical descriptions of the stamps include the commemorative inscriptions from each stamp in quotation marks. Where appropriate, historical notes will follow each of the pairs of stamps and their technical attributes, as shown below. 1 C. (1897 - Scott #61) - "Our Queen, Sixtieth Year of Her Reign." Queen Victoria (1819-1901) celebrated the Diamond Jubilee of her Reign in 1897. This stamp features one of the famous portraits of the queen in mourning attire. 2 C. (1897 - Scott #62) - "Cabot -- Him That Found the New Isle." John Cabot (born: Giovanni Caboto, 1450-1499) was actually an Italian, born in Venice. Similar to his fellow countryman, Christopher Columbus (born: Cristoforo Colombo, 1451-1506), John Cabot was a navigator and explorer, and he received his commission for exploration from the monarch of another country. King Henry VII (1457-1509), the first Tudor monarch of England, envisioned an English Empire. In 1496, King Henry VII issued a Royal Patent to John Cabot, to "search for unknown lands in the west". Cabot discovered what would become known as Newfoundland and the Labrador Coast, and he is renowned today as being the first European to encounter the mainland of North America, since a Norse expedition, sailing from Greenland at the beginning of the 11th Century, had done. Between 1497 and 1499, Cabot made three voyages to Newfoundland. Sadly though, while returning to England from his third voyage in 1499, John Cabot and his ship were lost at sea. The inscription on the 2 C. denomination stamp above is actually true. It shows a portrait of "CABOT", but not of "John Cabot". The portrait shown on the stamp is actually from a painting of his son, Sebastian Cabot (1477-1557), by Hans Holbein the Younger (1498-1543). 3 C. (1897 - Scott #63) - "Cape Bonavista -- The Landfall of Cabot." Cape Bonavista is located on the Eastern side of Newfoundland Island. It is believed to be where John Cabot made landfall on June 24, 1497. 4 C. (1897 - Scott #64) - "Caribou Hunting -- Newfoundland Sport." 5 C. (1897 - Scott #65) - "Mining -- One of the Colony's Resources." 6 C. (1897 - Scott #66) - "Logging -- One of the Colony's Resources." 8 C. (1897 - Scott #67) - "Fishing -- One of the Colony's Resources." 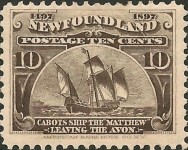 10 C. (1897 - Scott #68) - "Cabot's Ship The Matthew -- Leaving The Avon." The inscription is a bit confusing. The depiction is of the Caravel "Matthew" on the Avon River, near Bristol, England, departing on one of its voyages of discovery to the New World. These Newfoundland stamps, like many other British North American stamps of this era, were printed by the American Banknote Company. 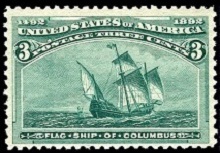 Since there were no actual paintings of the "Matthew" available, the American Banknote Company used the same plate that was used for the 3 C. denomination of the U.S. Colombian Exposition stamps five years earlier. Though the source of the engraving is unknown, it is believed to be from a Spanish print depicting the "Santa Maria", the flagship of Christopher Columbus. 12 C. (1897 - Scott #69) - "Ptarmigan -- Newfoundland Sport." 15 C. (1897 - Scott #70) - "(Seals) -- One of the Colony's Resources." 24 C. (1897 - Scott #71) - "Salmon Fishing -- Newfoundland Sport." 30 C. (1897 - Scott #72) - "Seal of the Colony -- Fisherman Bringing Gifts to Britannia." 35 C. (1897 - Scott #73) - "Coast Scenery -- An Iceberg Off St. John's." 60 C. (1897 - Scott #74) - "Henry VII Who Granted Charter to Cabot to Discover New Lands." The eight new pictorial definitive Newfoundland stamps shown above were introduced, beginning in 1897. These new designs feature portraits of contemporary members of the British Royal Family, including a very young Prince Edward (called: David), the future King Edward VIII. 1/2 C. (1897 - Scott #78) - Prince Edward (King Edward VIII) - Olive Green. 1 C. (1897 - Scott #79) - Queen Victoria - Carmine Rose. 1 C. (1898 - Scott #80) - Queen Victoria - Yellow Green. 2 C. (1897 - Scott #81) - Prince of Wales (King Edward VII) - Orange. 2 C. (1898 - Scott #82) - Prince of Wales (King Edward VII) - Vermilion. 3 C. (1898 - Scott #83) - Princess of Wales (Queen Alexandra) - Orange. 4 C. (1901 - Scott #84) - Duchess of York (Queen Mary) - Violet. 5 C. (1899 - Scott #85) - Duke of York (King George V) - Blue. The 3 C. definitive postage stamps of 1890 were overprinted and revalued to 1 C. in October of 1897 (Scott #75-77). There are three different types of the overprints on these stamps, with the difference being in the size of the overprint and the particular font used. The first type is shown above. The second and third types are very expensive. Consult the specialized catalogs for details. Only authenticated examples of these stamps should be purchased.